If you’re tired of tripping over your kids Lego, then you need to read this article on the best Lego table with storage options. 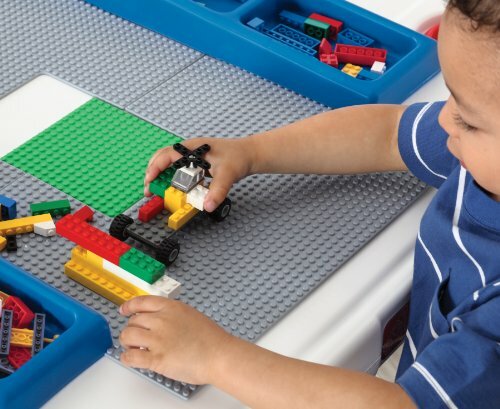 A kids Lego table is not only one of the best Lego storage solutions, but it is also a great way to provide a dedicated space for your child to play with their Legos. 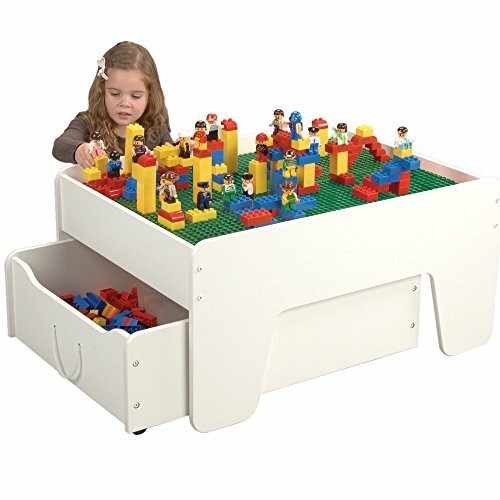 Some of the best Lego tables with storage are even multipurpose and double as everyday activity tables for kids. 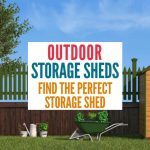 In this Lego table for kids guide, I am going to take you through everything you need to know to ensure you buy the best Lego storage for your household. 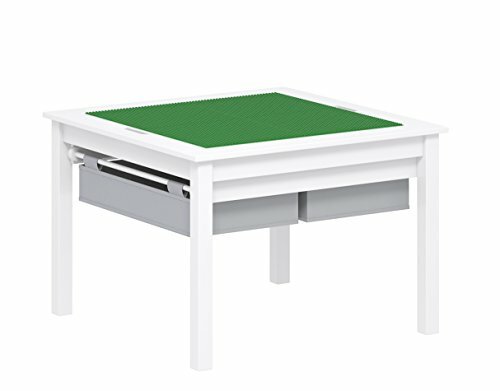 We will look at different Lego playing table sizes, the various built-in Lego pieces storage options, other uses for a Lego building table, followed by a closer look at some of the best Lego tables for sale right now. So let’s put an end to Lego pieces all over your house and find the ideal Lego building table with storage for your little ones! 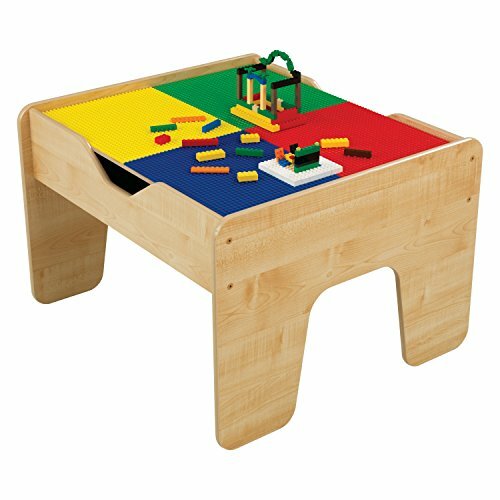 Quite simply a Lego play table is a specially designed table with built-in plates for children to build their Lego on as well as having built-in storage. The main benefits of having a Lego activity table with storage is providing your child with a dedicated place to play and build their Lego. 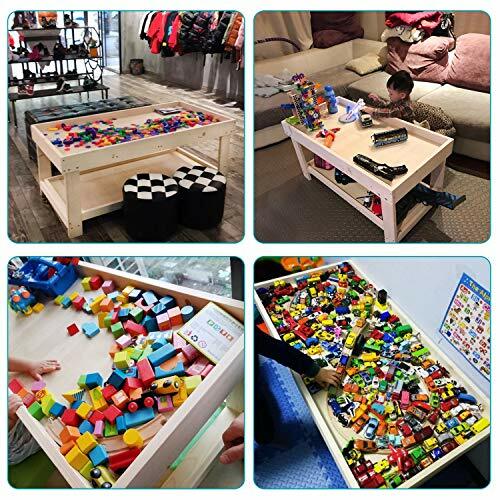 Having the Lego stored within the Legos building table is convenient for your child, as they don’t need to gather their Lego from one place to another to play with it. This will help eliminate having random pieces of Lego all over your house – although I can’t guarantee it will remove the problem completely! A Lego builder table is also designed at the perfect height for your little one. 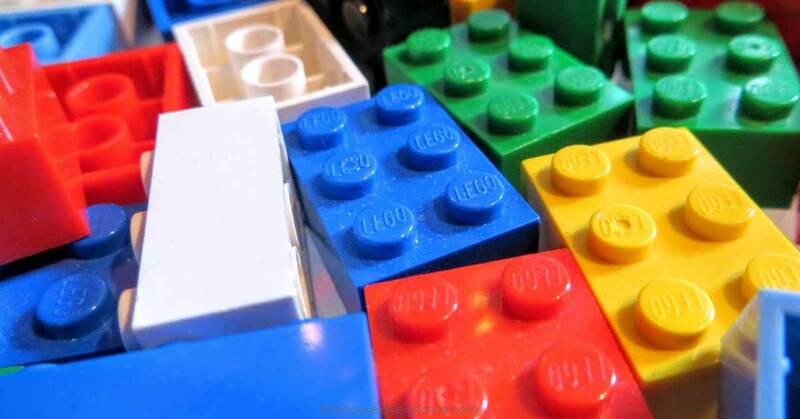 Having their Lego at the right height will provide a better overall experience for your child. 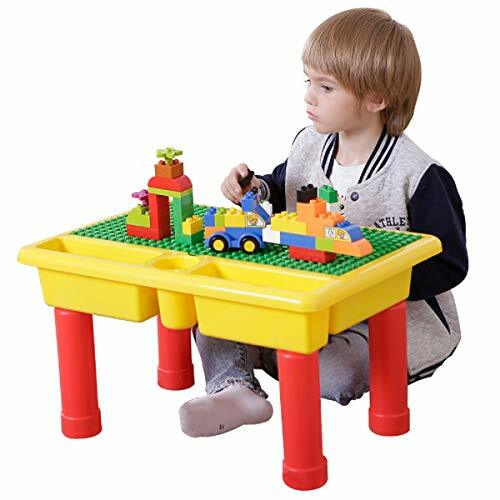 If you purchase a multipurpose Lego activity table, your child can also use the table for other activities such as drawing, water play, reading books, playing with playdough or any other activity that requires sitting down. The uses are endless making a good quality Lego storage table well worth the investment. Don’t have time to read my entire review? If you are looking for the best Lego table and storage solution, I recommend the UTEX 2 in 1. I think all the children play tables in this article are great, but the reason I chose the UTEX 2 in 1 as the best overall was due to its spacious storage drawers. I think having Lego storage drawers make so much sense compared to the standard under the tabletop storage, which requires you to lift the table top to access. This isn’t very practical when playing. Keep reading below for more information on the UTEX 2 in 1. Below is a quick comparison table of all the different Legos activity table options in this guide. Keep reading below for a more detailed look at each Lego table for sale. 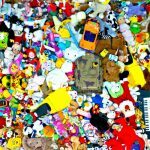 Before purchasing a children’s Lego tabletop with built in storage, consider the following factors. When it comes to the size of the Legos table you purchase, there are a few different factors to consider. Perhaps the most important factor to consider, is how much space do you have in your home to accommodate a Lego block table? There is no point buying a good quality Lego board table only to discover it is too big for your house. You can purchase a large Lego table with storage as well as a small Lego table with storage and various sizes in between, so you should be able to find the perfect size for your home. Also, consider the age of your child. If you’re looking for a Lego table for toddlers, then ensure the height is right for them. Or perhaps you’re considering Lego tables for older kids, so your little one can grow into the table. These are all things you should consider before making your purchase. 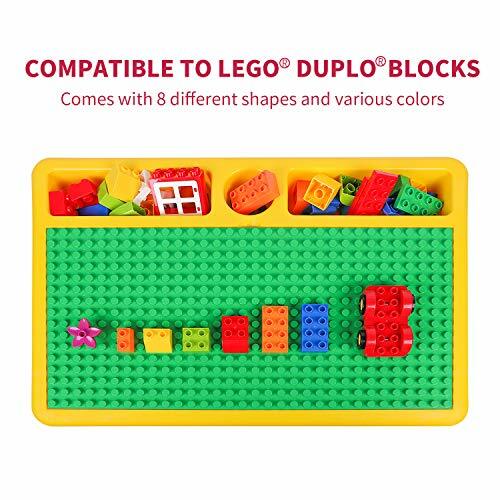 In terms of compatibility, here I am referring to the blocks your child plays with and whether they are compatible with the Lego table set you’re considering buying. SomeLego table and storage sets claim they are compatible with a range of block types and brands, whereas others are designed just for Lego or larger blocks such as Duplo. There would be nothing worse than setting up your child’s brand-new Lego storage and play table only to discover the building plates weren’t compatible with their favourite blocks. 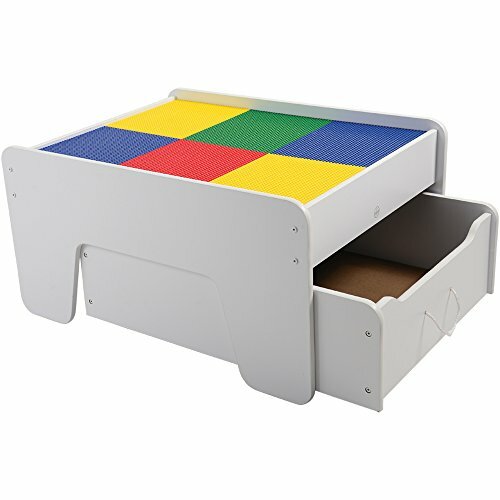 The storage for Lego pieces on the kid’s activities tables can be in the form of drawers underneath the table, build in pockets or storage underneath the table top which requires you to lift off the table top to access. The storage space differs quite dramatically from small to very spacious. Usually, you will find that easily accessible storage, such as side pockets, will store only a small amount of Lego. Whereas the more spacious storage compartments aren’t as easily accessible. My recommendation is to go for a a Lego storage unit with side drawers or a trundle which is a good balance between the two but does usually cost a little more. When space is limited, I always recommend purchasing one of the Lego block tables that can be used for multiple purposes. 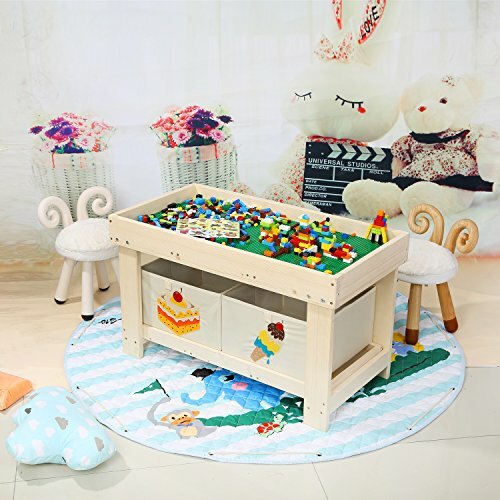 Why go for a kid’s activity table designed just to play with Lego when you can get a kid play tables that can be converted to a smooth surface for other activities or even used for water play. Like any product you purchase, you’re going to want to consider what the Lego play table with storage is constructed of. If you’re just after a cheap Lego table, then a plastic Lego table with storage will do the trick. Whereas if you’re wanting something that you can hand down to multiple children then its worth investing in a sturdier wooden Lego table. The UTEX 2 in 1 activity table has it all! It’s can be used for various purposes, has plenty of storage which is easily accessible whilst playing and looks fantastic too! 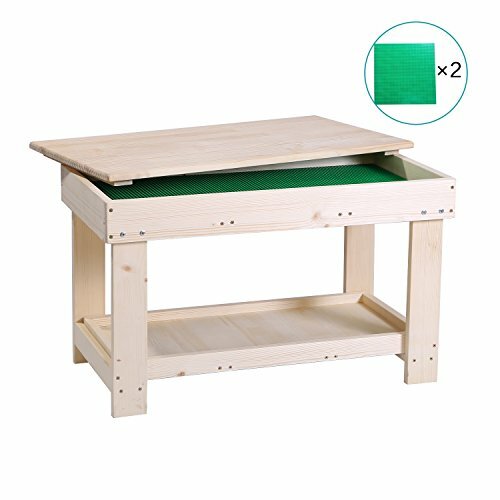 At a height of 21 inches, this child activity table is the perfect size for younger kids as they can easily play whilst kneeling or sitting on the floor. So no need for additional chairs, although you can if you like. This child activity table has built-in construction panels which are compatible with a range of popular branded building blocks including Lego. And when your child is done playing Lego, the tabletop can easily be flipped over so your little one can enjoy other activities on the smooth tabletop. There is plenty of storage with this children’s play table. I love how the storage compartments are in the form of 2 drawers which can easily be accessed whilst playing. Most child play tables with storage require you to lift off the table top, so this is one of the reasons why I have listed this as my favourite Lego activity table with storage in these reviews. This is a lovely looking play table with storage which will look great in any home. Plus it’s well constructed, reasonably priced and a great size. Just be wary though if you’re wanting this for a Duplo Lego table, as some customers have reported problems with Duplo, whereas others say its fine. If your kids have loads of Lego, plus you want a table to store other toys, then you need to look at this large Lego table with storage from YouHi. This table is the ideal height for children from around 3 years and over and is long enough for multiple kids to play at once. Being made from high-quality pine, it is a sturdy table capable of standing up to children’s sometimes rough play. 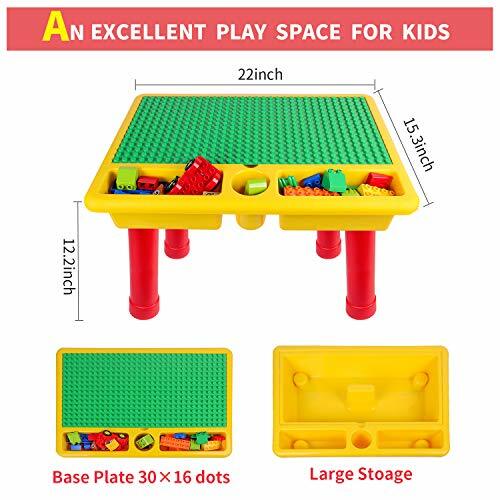 The design of this children’s activity table with storage is quite unique compared to the other tables in these reviews. There is oodles of storage space under the table top, however, what I really love are the racks under the table where you can place large baskets for additional Lego storage ideas, or even other toys. When it comes to playing, the kids will love the extra-large building surface. The building boards are removable, so you can use the space for other activities too. You can even use the space for sand play, cars trains or a craft table. Once they are done, just put the table top on to hide the mess or to create a clear space for more activities. Whilst not the cheapest table in these reviews, I really like this activity table. It is super versatile and has heaps of storage. I think this table could also really adapt to your child as they grow. Another great option for a kid’s activity table with storage is this 2 in 1 KidKraft Lego Table. 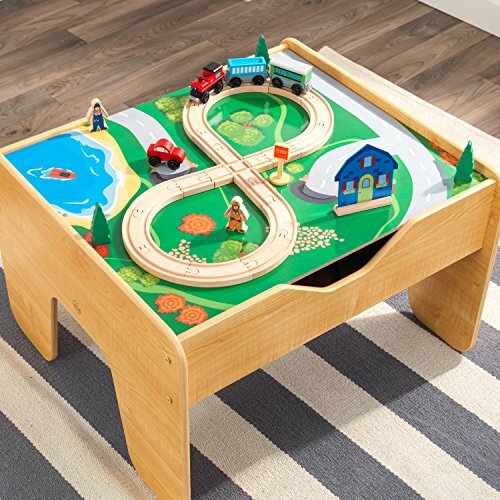 This is a fantastic well-constructed table, with multiple uses and even comes with a 200 building brick set and a 30-piece wooden train starter kids! 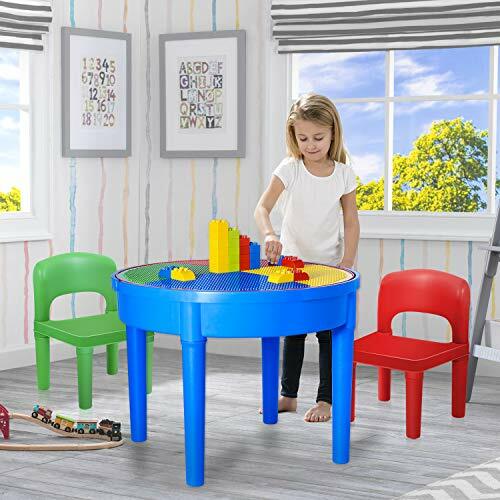 Like all good kids play tables, the KidKraft activity table has a reversible table top which features a smooth playing surface on one side and a building brick surface on the other. This table is ideal if you’re looking for a Lego train table, as it comes with a train kit. The train set includes track pieces, a 3-piece train, house, figurines, trees, street sign and streetcar. The little ones will also love the included 200 building bricks which are compatible with Lego bricks. The KidKraft 2-in-1 activity table is a great size for little kids and there is plenty of room for more than one child playing at once. There is also plenty of storage space under the table top. If you’re looking at a train and Lego table or activity tables for toddlers, which includes storage and building block surface, the KidKraft 2 in 1 activity table is certainly worth considering. 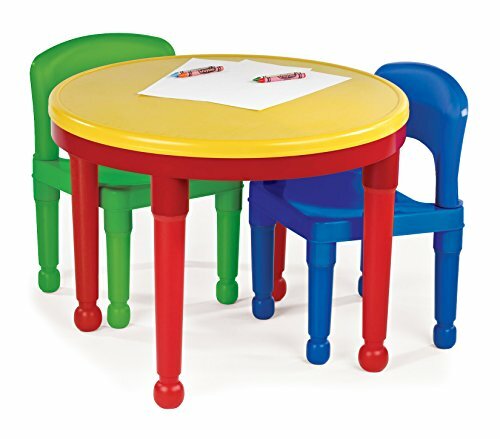 For parents after a Lego table with chairs set for their young children, the brightly colored round Lego table from Tot Tutors is a popular choice. 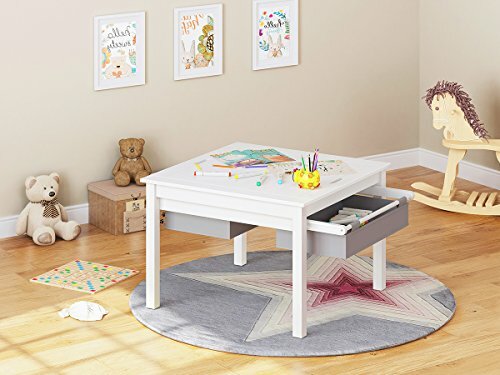 This play table for toddlers set is made from lightweight plastic making it easy to move from room to room as required as well as being easy to clean. Assembly is easy too as it simply snaps together. This compact little set is perfect for adding to a toddler’s bedroom or placing in the living room. If you’re looking for much more than just a Lego activity table with storage, check out this 4 in 1 Lego table and chairs set from Exercise N Play. It is an ideal activity table for toddlers. 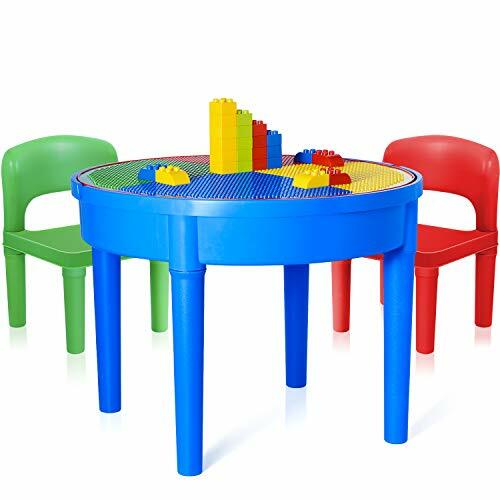 This table and chairs set not only comes with a building block surface so the kids can play with their Legos, but it also converts to a water play table, has a smooth table top for other activities as well as plenty of storage. The building table is compatible with Lego, Duplo and other major branded blocks. It even comes with 25 jumbo bricks to get the little ones started. This is a brightly coloured kid’s Lego table with storage made from sturdy, lightweight plastic. It is super easy to assemble as it simply snaps and locks together. 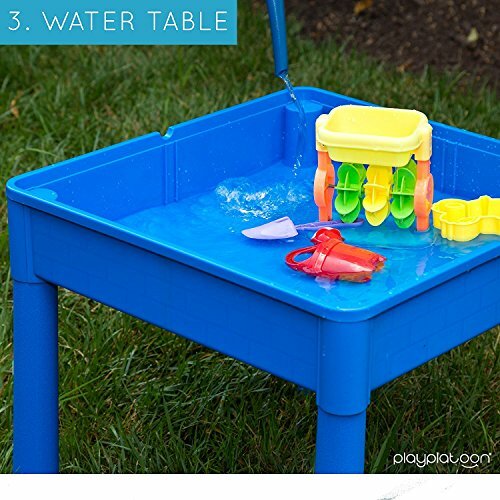 And of course being lightweight you can easily move it from room to room or to take outside for water play. The storage for this table is under the table top, which is not ideal, but still for a quality yet inexpensive set with such versatility it is well worth considering. 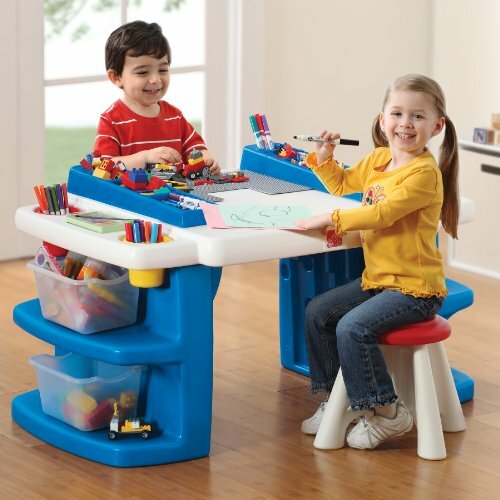 The Play Platoon 3 in 1Kids Activity Table and Chairs set is very similar to the Exercise N Play featured above. Whilst the Exercise N Play refers to itself as a 4 in 1 and the Play Platoon refers to itself as a 3 in 1, don’t be confused, they are both have the same features – building play, water play, smooth table top and storage. Like the Exercise N Play, this kid’s play table with storage comes with a building block surface which is compatible with Lego, Duplo and most other major branded blocks. It even comes with 25 jumbo bricks to get the kids started. 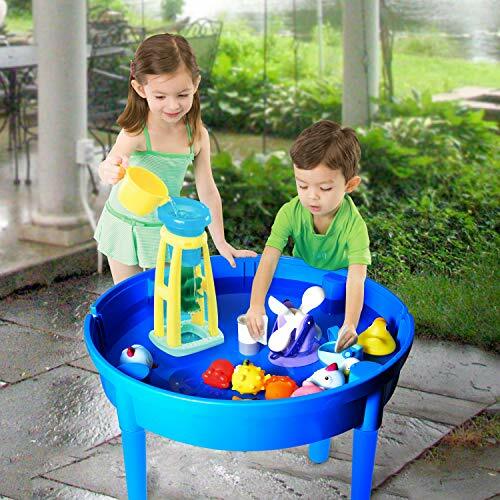 Once the kids have had enough of playing simply remove the table top for water play. 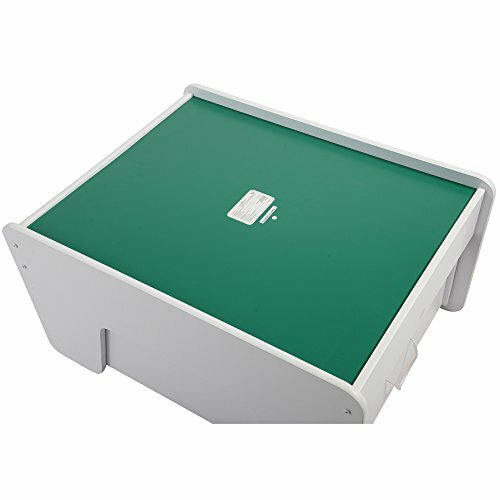 The table top can also be flipped over for a smooth surface for other activities. 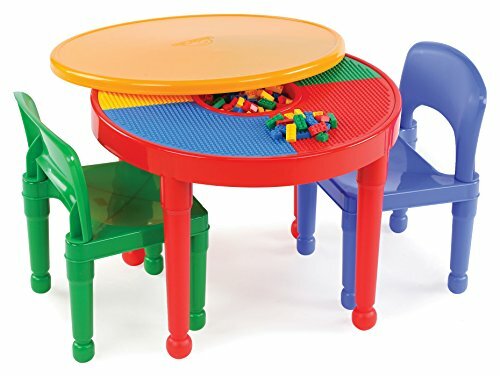 Like the Exercise N Play, this is a brightly coloured Lego table with storage and chairs made from sturdy, lightweight plastic. 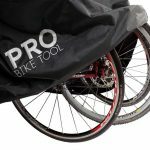 It is super easy to assemble as it simply snaps and locks together. And of course being lightweight you can easily move it from room to room or to take outside for water play. Again the storage for this table is underneath the tabletop, which I’m not a huge fan of, but that seems to be the norm with the inexpensive sets. The main difference between this set and the Exercise N Play is that the Play Platoon is square whilst the Exercise N Play is a round table and the chairs of the Play Platoon are slightly higher at 10 inches compared to 7.5 inches. 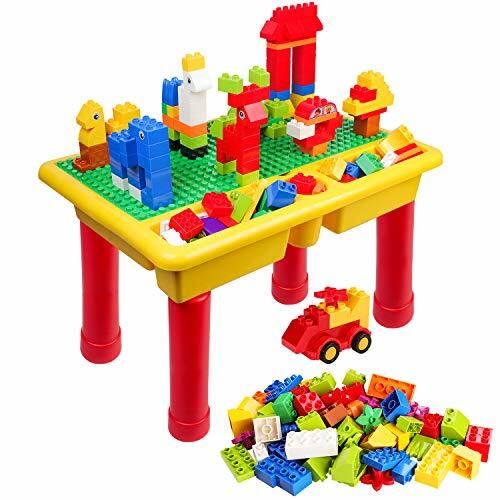 This small Legos Duplo table from Burgkidz is a very highly rated kid’s play table with storage as well as being a best seller among families with young children. At 22 x 15 inches, this is a compact table, in fact, the smallest in these reviews. However being compact makes it ideal to move around the house so your little one can be close to the rest of the family. 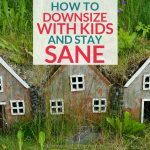 You can even remove the legs and your child can play with the tray table on the lounge or at the kitchen table. The building surface is double sided so it can be converted to a smooth side for other activities. For storage, you can store legos underneath the building surface as well as in the small storage slots on the side. The smaller storage is great for easy access whilst your little one is playing. 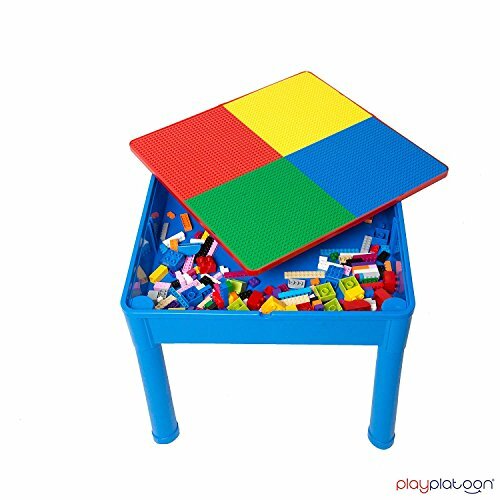 Also Included with this Lego Duplo table with storage is a 68 pack of large blocks, perfect to get little ones started, however, it is also compatible with Lego, Duplo and other major branded blocks. 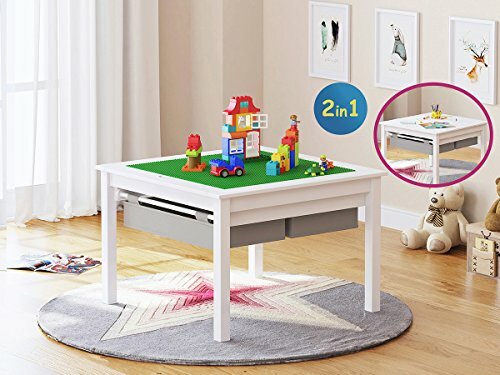 With such an inexpensive price tag, its no wonder this is such a hot seller activity table for toddlers, but just keep in mind that if you want something that’s going to adapt to your child as they grow, one of the tables above might be a better option. If you’re looking not just for a building block table but the ultimate activity table, then the Step 2 Lego table with storage is a perfect choice. This table has a spot for everything! The play space has room for 2 building block plates which are removable so can be removed for other activities. There are 2 storage trays for blocks, 4 cups perfect for pens and pencils and 4 bins for craft items or smaller toys. What I love most is that there is a spot for all the storage and its all removable so can easily be cleaned. Oh and there is even a place to store the building plates when not in use! 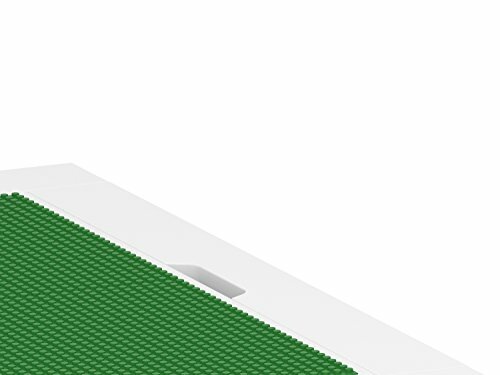 The included building plates are compatible with Lego and Mega blocks, so ideal if you’re looking for one of the compatible Mega blocks tables. The activity table also comes with one stool. This table is fantastic for families who want storage galore. It’s light and compact and can easily be removed around the house. 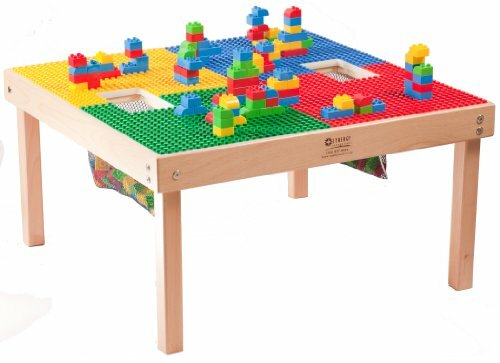 The Mega block Lego table is perfect for families with young children who like to play a range of activities. If a large building space is more important to you than loads of storage than take a look at this play table by Fun Builder. 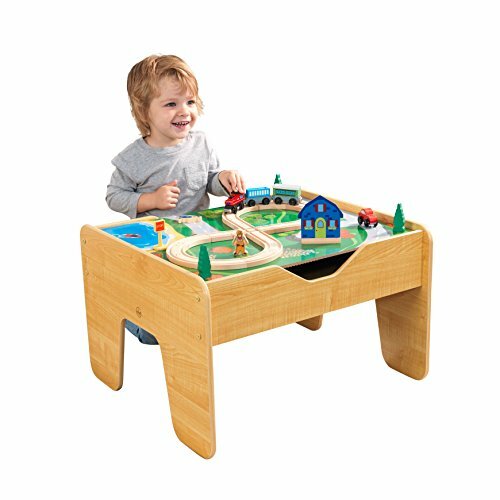 This is one of the most highly rated play tables for toddlers. First up, you need to know this table is only compatible with Duplo and Mega Blocks, so ideal for smaller children who aren’t ready for smaller Lego pieces. The building space is large at 32 x 32 inches – the largest area of all the tables in these reviews. 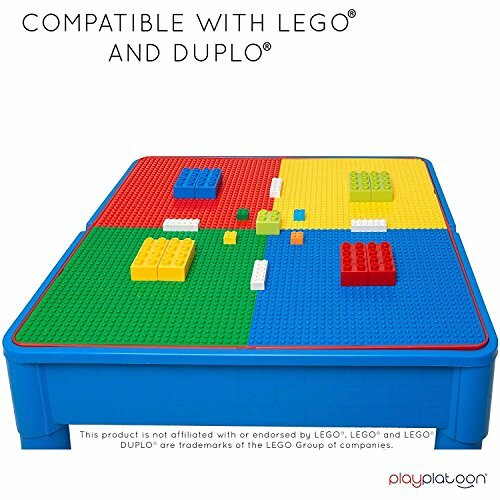 There is some storage on this Duplo blocks table in the form of two mesh pockets in the centre of the table. Whilst not a huge amount of storage I like how the kids can easily access their blocks while playing, no need to lift off any tabletop or open drawers. This Duplo play table comes pre-assembled! Yes, that’s right no assembly required. 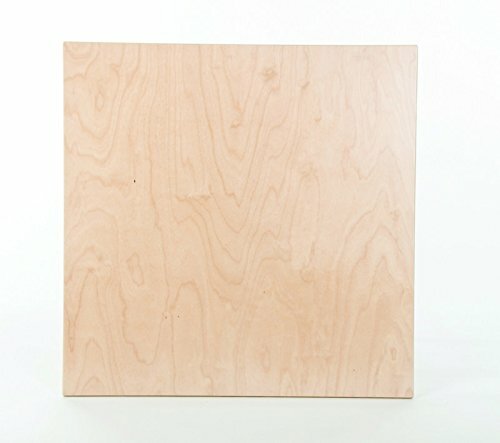 It’s certainly built to last from solid wood, so you hand it down to younger siblings or even sell it once you’re done. 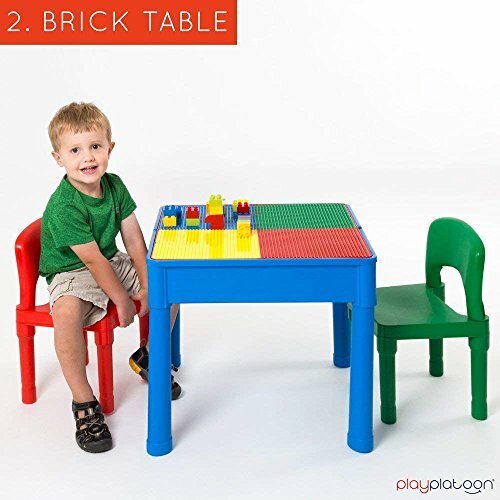 This block table for toddlers even comes with an optional table top to convert the table into a standard table for other activities. If you’re after a Duplo table for the little ones with loads of building space but not so concerned with storage, this is the table to buy. 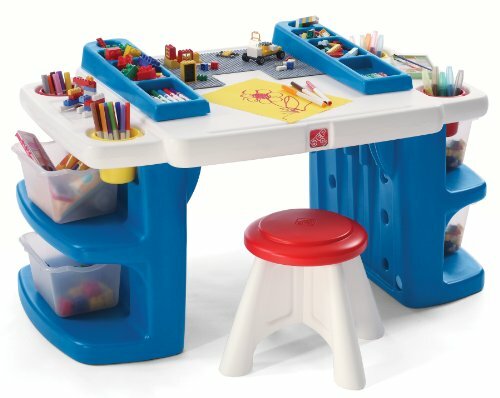 The Constructive Playthings activity table comes with not only a large building space but also stacks of storage too. If it wasn’t for the fact that this table is only compatible with Duplo, I would have definitely listed it as my pick for Lego storage table. Nevertheless, I included it in these reviews as it is great for Duplo fans. This table comes with a hefty price tag, but it certainly has plenty of great features. It is a super solid table built to last for years and years. The building space is a large 25 x 34 inches and the trundle drawer underneath is the same size too, so you have oodles and oodles of room for all your little ones Duplo. As you know I’m a big fan of having a drawer as this makes the blocks so much more accessible for the kids as opposed to storage which is underneath the table top. One of my other favourite features of this Duplo table with storage is that it has wheels on the bottom. Being made from wood it’s not the lightest table but being on wheels means you can wheel to wherever you like in the house. Plus like all good activity tables, you can flip over the building top to convert the table into a smooth playing space. 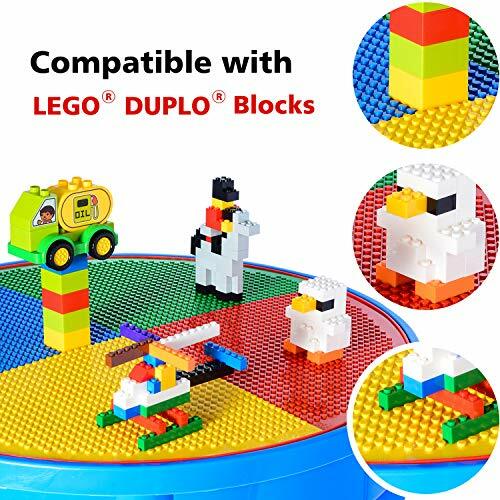 As you can see this is a pretty awesome table, it has so many great features, but just keep in mind it is only compatible with Duplo, so if you have a little Duplo fan in your household, this table is definitely for you.